Last week, I posted a tutorial on this simple empire waist dress that I made from the adorable camper fabric that fabricworm.com sent me. 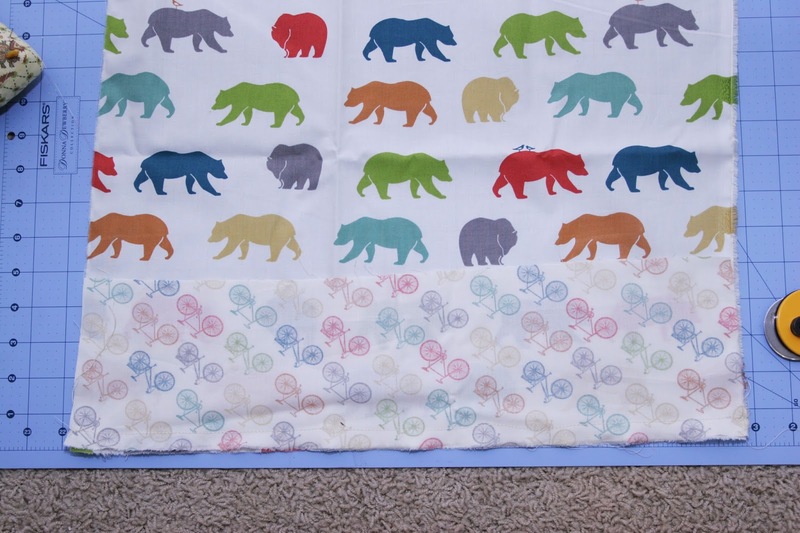 Well, they also sent me this awesome organic bear fabric from the same line. 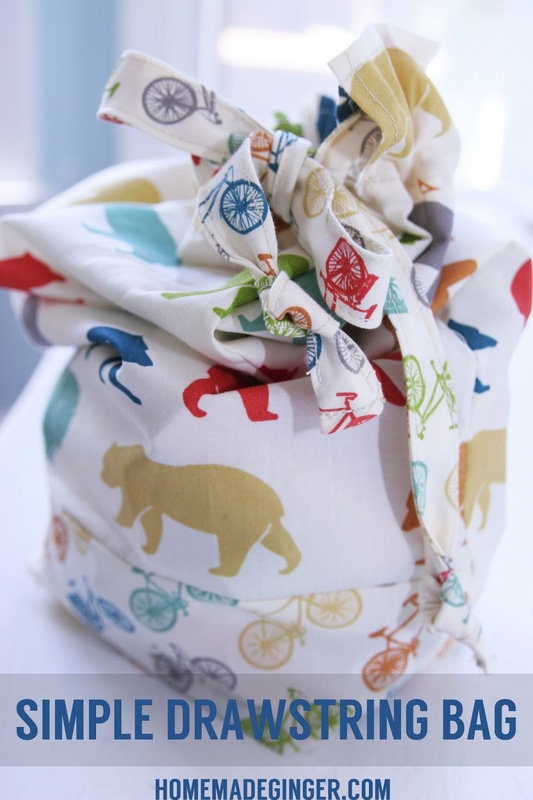 I combined it with the adorable bicycle fabric to make this simple drawstring bag. I love finding good tutorials online. 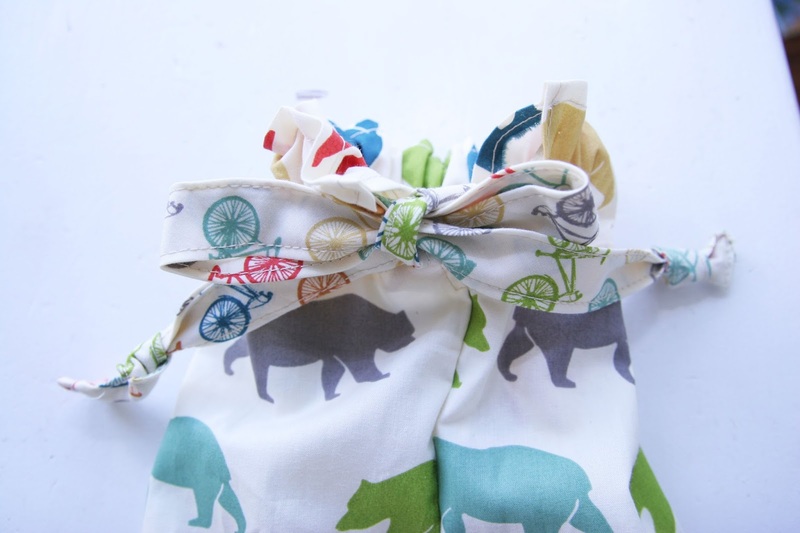 I came across this amazingly simple drawstring bag tutorial by Diary of a Quilter. 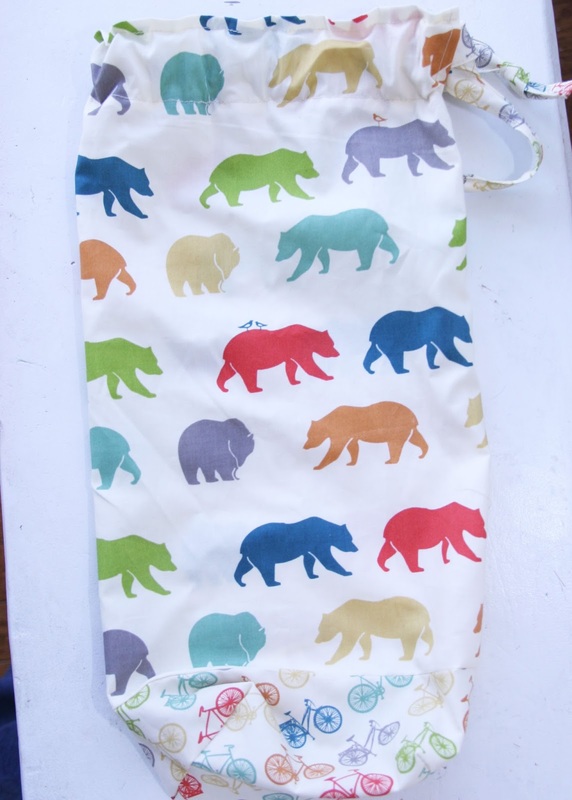 I made a few modifications to come up with this little bag that would be great for storing blocks or toys. The first modification I made was that I wanted to use 2 fabrics. So I just cut two pieces and sewed them together. The square is 18X18 inches and the rectangle is 18X5 inches. I just put them right sides together and stitched away. For the rest of the bag, I just followed the tutorial on Diary of a Quilter. No need for me to repost all of those steps, just check out her blog! But, the other change I made was to use the bike fabric for the drawstring instead of ribbon. I thought ribbon would make it too girly and I also thought it would be fun to repeat that bike fabric up on the top. I simply just made my own bias tape and top stitched along the top and bottom. This is a great tutorial on making your own bias tape. I love how this little bag turned out! 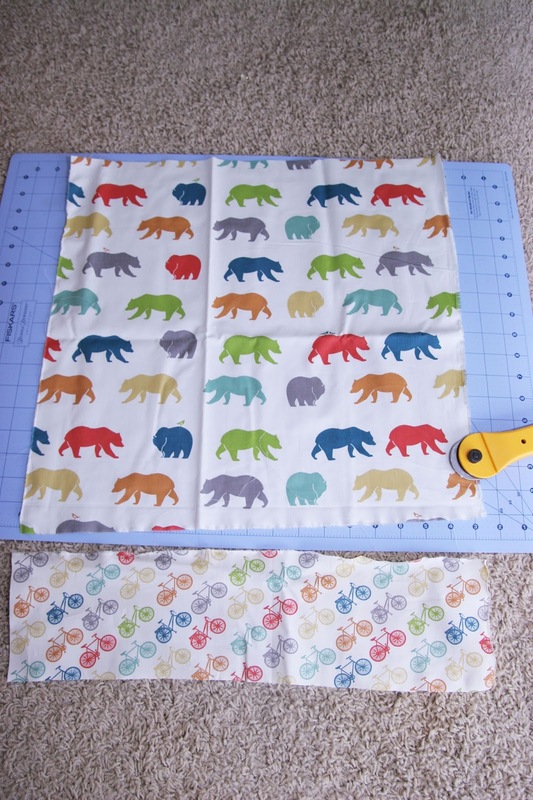 The simplicity of the pattern really shows off the adorable fabric. It would be so cute in a little boy’s room, sitting on the shelf holding his little treasures inside. 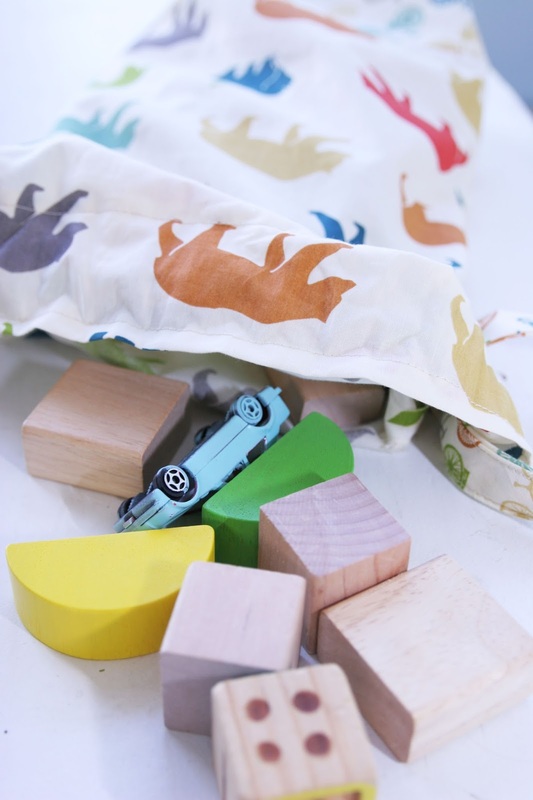 Thanks again, Fabricworm for the adorable fabric! Ooo I love that fabric! I have been meaning to sew a new bag for my son's blocks. The cheap zipper on the one they came it broke a while ago, this one would be absolutely perfect. Looks nice and easy to make too. Thanks for sharing! I love this! one question: the link for the bias tape tutorial takes you instead to the tutorial for the empire-waist pillowcase dress. is there a different link? thanks!